Our guest blogger: Ierian is but a simple 20-year-old, trying to survive capitalism and an aerospace engineering major. They’re autistic and have a special interest in Mass Effect, and sometimes get yelled at for talking about it too much. You can find them on Tumblr here. 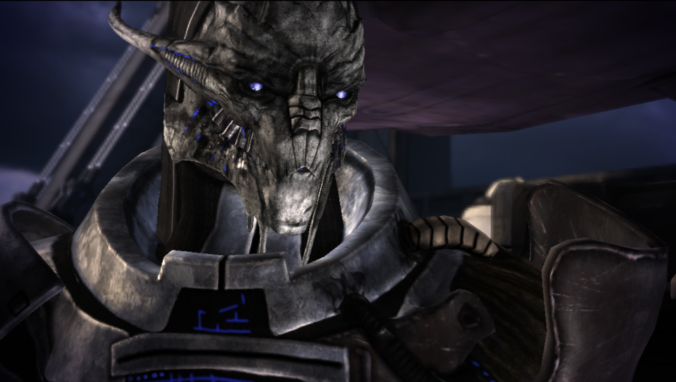 This week Ierian is going to talk to us about Saren and his character development. There are spoilers for the Mass Effect books and comics in this guest post. Every Friday, we showcase an artist involved in the Mass Effect community. This is Artist Spotlight. This time Deb interviewed Inklie, an artist with a unique style. You might know Inklie for her drawings of the Krios’ family, Javik or her renegade Shepard, Grace. Our guest blogger: Mallory is a 21 year old college student studying screenwriting and a long time Mass Effect fan. Find her on Tumblr here. Today she tells us how she started to love female characters like Ashley Williams and Miranda Lawson. Game Informer has provided us with exclusive information about Mass Effect Andromeda. Here’s a summary of all videos and articles so far. We’re introducing a new feature on M.E.L.’s blog: Artist Spotlight. Every Friday, we’ll showcase an artist involved in the Mass Effect community. This time, we wanted to put the spotlight on Herssian. Herssian is a popular artist who regularly draws Bioware characters. Her art is stunning and we recommend checking her work out! Deb interviewed her for M.E.L. Game Informer has posted a new video where Joel MacMillan (Mass Effect Andromeda’s Art Director) introduces a new race: the Kett. Hello and welcome to Mass Effect Lore! It’s been nearly 5 years since Shepard fought the Reapers with their ragtag crew. Nearly 5 years since the fandom’s had a new core experience in the Mass Effect universe. This past Monday, November 7, 2016, we were formally introduced to our new protagonist(s), our new galaxy, our new game. I, for one, am excited for what the future will hold with Andromeda. There is going to be so much to explore, to learn, to experience, and I could not be happier. What though, of Shepard? Of the Milky Way? I know some people are holding on tight, refusing to let go of characters, story threads, canons, and head canons alike. Does Andromeda’s release mean that we are closing the curtain on Shepard & Co? For me, definitely not. The Ryder family and their adventure are going to enrich my already fantastic Mass Effect experience. I hope that the Ryders will help grow and shape me just as Shepard has. I hope that they too, will enable me to become stronger, more confident, and more secure in who I am and where I belong in this world. Because that, over anything else, is what Shepard has done for me. Mass Effect enters each player’s life differently. Some play because of BioWare, some play because of space, some because of relationships. I played because of friends. It started with them. I play now out of love, nostalgia, and because Shepard is an undying source of strength for me in difficult times. Commander Shepard’s fight against Saren, the Collectors, and finally the Reapers is epic. There is no question there. It’s big, it’s daunting, and the overall implications are frightening. Through it all though, Shepard remains steadfast in their mission. Odds are usually stacked against them and oftentimes they must take a roundabout approach to succeed. Shepard’s story helped me realize that there will be obstacles I’ll face and that I can overcome. There will be times when taking a different approach is better than the seemingly clear path ahead. I may also need to ask for help even when I’d prefer not to. I’ll have unlikely allies and friends, and in time, I may come to think of some of them as family. They’ll help me and I can and will help them too. Mass Effect is to me, and to so many others, so much more than a game. It’s a touch-point in our lives that we keep coming back to for reassurance. Shepard is a constant companion and a beacon of hope through those tough days. They teach us how to persevere when we feel we cannot. I know that my life would not be the same without Mass Effect in it and now that I am here on the brink of something wholly new and yet incredibly familiar I can only be excited. Andromeda is allowing me, someone who came to the series late, a chance to experience the hype and anticipation. These few months are going to be painful in the best way as we all wait with bated breath to see what awaits us in our new galaxy. Who will we meet? What will we see? I hope to make new friends, not to replace those I made on the Normandy, but to add to my coterie of comrades. I cannot wait to discuss with my real life friends about the choices they’ve made with their Ryder and what came from those choices down the line. The path is unknown, not only for Ryder themselves, but for us as a player. My one hope for the future of Ryder is for them to follow in the footsteps of Shepard. To make me see the best in myself when I cannot. To provide me with courage when I am feeling weak. My hope for the franchise as a whole is that it will grow and expand and give me so many new things to learn. That Andromeda will not overshadow the original trilogy, but stand alongside it, as a jump to the future while harkening back to the past. I will not be leaving Shepard behind. I cannot. To the rest of the N7s and Pathfinders out there: Suit up and look to the skies. Never stop dreaming. We started by working on a Mass Effect guide. It was important to us (the M.E.L. team) to launch our website with a strong foundation. This guide contains information about Shepard, the games, the plot of the trilogy, and other information regarding the lore (the galactic community, major events…). We also have a list of all Mass Effect products that are considered a part of Mass Effect canon. Our main goal with M.E.L. is to go over the entire Mass Effect lore and provide information, context and explanations. We’re working hard on it. M.E.L. is always going to be a work in progress, one that we hope you’ll like. As you can see, our homepage is a blog; here you’ll see announcements, news about the Mass Effect franchise and articles from our team or guest bloggers. Speaking of Andromeda news, check out our Andromeda page. This page will be updated every time we learn something new about the game. We’ll leave you with one message: We are travelers, constantly moving forward…and looking back.